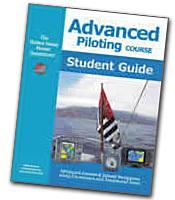 Advanced Piloting – is the final inland and coastal navigation course. It furthers your understanding of electronic navigation and tools to include the use of radar, depth sounders, chartplotters and digital charts. It also expands your understanding of safe navigation by showing you how to “fix” your position with precision by traditional techniques, how to implement “avoidance navigation” to stay clear of hazards, and how to navigate in the presence of tides and currents.